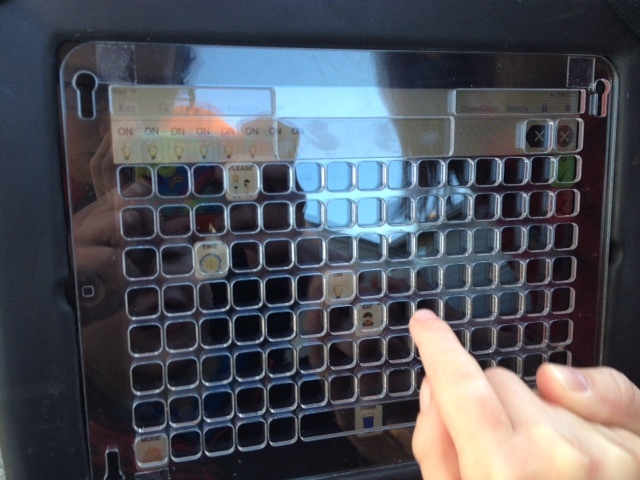 Aidan has been using his Speak for Yourself App with keyguard for two weeks now. We went into this knowing that Aidan understands cause and effect, can isolate his pointer finger and shows intention to communicate. To get Aidan started, we’ve used his most motivating activity. Can you guess what that is? Yes, driving. We’re using a core word (on) in a totally functional way. He actually needs someone to turn his wheelchair on. Notice that he takes my hand at the beginning. That’s intention. He’s using my hand to stabilize his. I did help him touch the button once he got close to it. We’re in the learning phase. He’s so smart. I knew that. So glad I didn’t stand in his way. In other news, Grover digs AAC too. Love this! Yes, he is smart! Why are we always surprised? I think we really just marvel at the process becsuse the communication road is so exciting! Go team Aiden!!! This is the coolest thing to see!!! I love seeing Aiden’s progress! Keep us updated!